THREE years ago this week, Kieran Tierney was a 15-year-old ball boy at one of Celtic Park’s most famous European nights. When Victor Wanyama headed the opener in the memorable 2-1 Champions League win over Barcelona, Tierney was on duty behind Victor Valdes’ goal and didn’t attempt to hide his emotions as he celebrated along with the rest of a delirious home support. That is exactly what Tierney has achieved, of course, making his European debut in the 2-2 draw at home to Fenerbahce last month. The 18-year-old has made a big impression in recent weeks with a series of eye-catching displays which have marked him out as a serious rival to Emilio Izaguirre as Celtic’s first choice for the left-back position. But, as he waits to learn if manager Ronny Deila will keep faith with him for Thursday night’s crucial Europa League meeting with Molde at Celtic Park, Tierney is certainly not getting ahead of himself. Perhaps he is appreciative of the career path which has been followed by Tony Watt, who was Celtic’s teenage hero that night against Barcelona when he scored the winning goal. Watt was unable to live up to the hype which surrounded him and is now plying his trade with English Championship strugglers Charlton Athletic. Having battled his way through his Academy development at Celtic, during which he was not always regarded as one of the club’s likelier prospects, Tierney is determined to find long-term success as a first-team player. “Tony is a great player and is doing well for Charlton,” he said. “But I just want to stay with Celtic as long as I can and keep working hard. “This is what I wanted, but there are times when you think it might never happen. You just need to keep believing. You go through different stages when you are younger. “You might go a month or two when you are not even getting a game at the age level you are playing in at the Academy and you are only on the bench. “But you can’t let that affect you at all. You just have to keep working as hard as possible. If you do that and the manager believes in you, then you will get a chance. 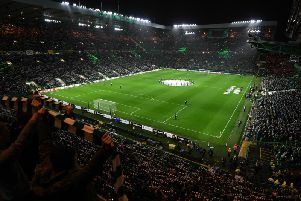 Tierney’s European debut pitched him in against the not inconsiderable challenge posed by Fenerbahce’s former Manchester United duo Robin van Persie and Nani. “That would be the most important experience so far for me,” he added. “That was the best experience and definitely the toughest one. “Of course I was nervous beforehand. There are nerves before every game, but especially when you know Parkhead is going to be nearly full and it’s a big Europa League game. “I took a lot of confidence from the game. I had a few good reviews about my performance and the manager was happy with me. Tierney filled in for the suspended Izaguirre on that occasion but both are available for the visit of Molde which is a game Celtic must win to maintain hopes of qualifying from Group A in the wake of their wretched 3-1 defeat away to the Norwegian side two weeks ago. “I will be ready if I’m picked,” said Tierney. “It’s 50-50. If the manager picks me I’m ready, but, if not, then I’m not disappointed. “Emilio is a great professional. The experience he has is amazing and I can only learn from it. He’s been happy to pass on advice. We speak every day and we are very close. He gives me a lot of tips and I can see him up close in training and learn a lot from him. “It’s good to have that competition. There are great players in every position at Celtic, so, if you want your chance, you need to earn it and when the chance comes round, you need to take it. Tierney is getting accustomed to a greater degree of recognition from the Celtic supporters and you sense it is something the personable youngster will never take for granted. “I don’t mind it if the fans want pictures or autographs,” he smiled “It’s actually a good thing because when you are younger that’s what you want. You want people to know who you are and that you play for Celtic. “I was outside the stadium all the time when I was younger. I would be trying to get autographs and pictures with the likes of Henrik Larsson and Bobo Balde.